Geolocation feature allows web browser like Google Chrome to inform specific websites about your physical location. By default, this feature is turned ON in Chrome browser. For example, if you browse Google Maps website – you may get pop-up bar at the top for permission by Google Maps to track your physical location. If you do not want to share your physical location with websites, just turn off geolocation tracking feature in Chrome. 1. 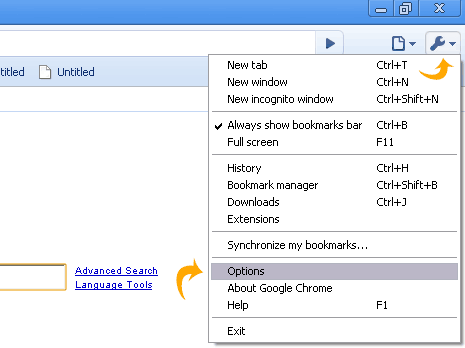 Launch Google Chrome browser and then goto Tools > Options. 2. 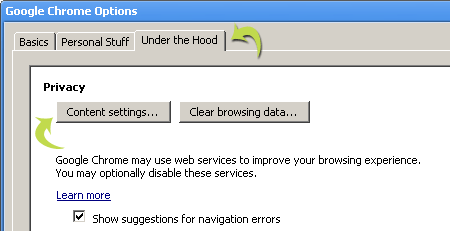 Click “Under the Hood’ tab on Options window. 3. Then click “Content Settings” button under privacy option. 4. In Content Settings pop-up window, click “Location” tab. 5. Click to select “Do not allow any site to track my physical location”. 6. Then click Close button, Geolocation is turned off in Chrome browser on your computer.